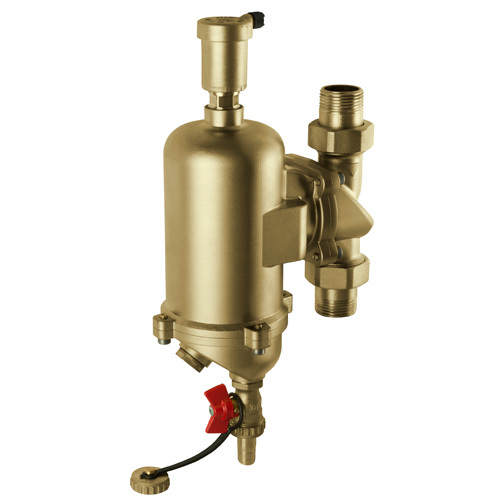 The HERZ Air- and Dirtseparator, made of DZR-brass, serparates mud particles and air from heating- and cooling-systems. Thanks to a large internal chamber the water speed is significantly reduced and this enables the air to leave through the air vent and the optimal flow abatement design ensures that the contained dirt is deposited as best as possible and can be drained via the ground ball valve. >For the collection of ferromagnetic particles the Air- and Dirtseparator includes a magnet. Separation without draining the system is possible. This prevents malefunctions and damage to heating- and cooling-systems. A periodic maintenance for the HERZ Air- and Dirtseparator is required – depending on the nature and quality of the medium. The lower part and the collecting chamber can be removed and the inner element can be pulled out for cleaning. Also the function of the magnet should be checked periodically.